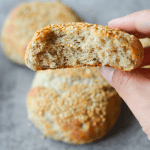 These are the best keto dinner rolls to help replace bread in your low carb lifestyle. This recipe is easy, filling, and delicious! Nutrition info is for 6 rolls. Please note that I am not a certified nutritionist. Any nutritional information that is discussed or disclosed in this post should only be seen as my best amateur estimates based on NET carbs. If nutrition is important to you, I highly encourage you to verify any data you see here with your favorite nutrition calculator.